Here is a sneak peek of my block, “Lollipop, Lollipop!” I pieced it in Bella right after receiving yardage this past fall from Blend Fabrics. Or maybe Bonjour, Mon Ami? Quiltmaker’s 100 blocks Volume 7 will be on newsstands on May 7th, and Quiltmaker is allowing me to giveaway an issue! I’m also going to throw in a beautiful fat quarter bundle of Michael Miller Red and Aqua fabrics. I used these fabrics in a quilt in Modern Holiday called Crossroads that recently put in an appearance at Quilt Con with C&T Publishing. I’ve been cutting up and assembling bundles for giveaways at my two Schoolhouses at market and I have an extra! To enter leave a comment telling me which of the above versions of “Lollipop, Lollipop” you like best. One entry per person please and make sure to leave me a way to contact you should you win. The deadline will be this Sunday the 5th at midnight. Note: This giveaway is now closed. Previous post: Blossoms… in Cuddle fabric! Love your block! My Schoolhouse is at 11:00…maybe in the same room as yours?! Oops I forgot to mention my favorite version…BonJour Mon Ami! My favorite is the block in Holiday Bouquet! Awesome blocks! Bella would be my fav. I love your block. I'd have to say my favourite is Lollipop Lollipop in Holiday Bouquet. Thanks for the chance. Bella, of course! I have some sitting here waiting to be made up into that lovely block. I like the block in Bella the most! I love Bella fabric, but in Lollipop is not very bold. I prefer Lollipop, Lollipop in Bonjour, Mon Ami for quilt. My favorite is in the Bella fabrics. Thanks! My favorite is in Bonjour, Mon Ami. And fingers crossed for this giveaway. I never win but I would be more than happy to win this one! My favorite is Bella. Thanks for the giveaway! I love the Bella version of Lollipop, Lollipop, though it's such a great block it looks fab in all variations. Thanks for the chance to win. I think I like Lollipop lollipop in Bella the best, but they are all three beautiful. Good luck with your schoolhouses. Wish I could be there. I think I like it in the holiday fabric best, but all a gorgeous! Just finished the Village Green pattern of yours. Really nice and fun pattern to make. Thanks! You have made this very hard to answer. If I really had to make a decision I guess I would have to go with Bonjour, Mon Ami. I love the prints. They're all beautiful, but I love Holiday Bouquet! The 100 Blocks series has really evolved into a fun idea to come up with new ways to make blocks. I really enjoy it. 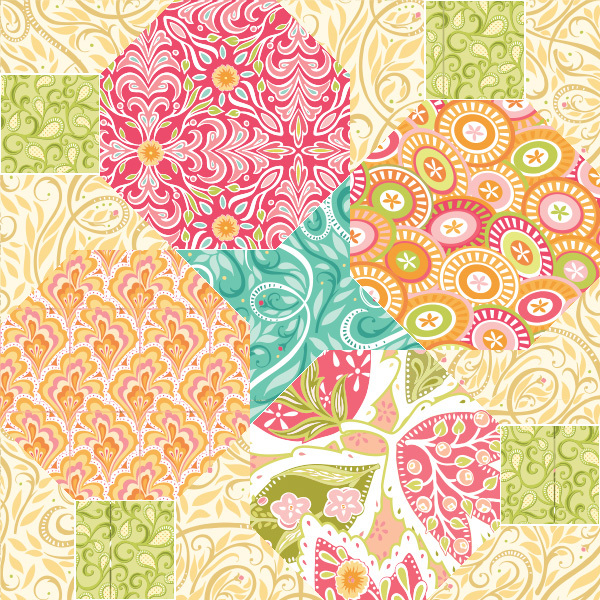 I like the Bella version — such lovely colors, perfect for a girly summer quilt. Boy, it's hard to pick a favorite, but, it would have to be Bella. Your block pattern, love it. They are all lovely! I'd choose Bella, if I had to pick. Thanks so much! I love it in the colours of Bella! I like your Holiday Bouquet version the best. The Lollipops really look like Christmas ornaments. Great block! I like the 'Bella' version best! That's tough you chose some great fabrics but I think the Christmas one is my favorite. What a cute block! I think it looks best in Bonjour,Mon Ami. Thanks for the great giveaway too. I like your Christmas lollipops. Holiday Bouquet is my favorite , maybe because I love Christmas 🙂 Thanks for the chance. Love the block. I think I like Bella the best if I have to choose. They are all very cute. I like the Bonjour, Mon Ami because the lollipops stand out the most with those prints. Thanks for the giveaway. It's gorgeous in BonJour, MonAmi! Love it! Cute block! I like it best in the HOliday Bouquet as it looks like ornaments with the star. Thanks for a chance to win. Great block. I'm a sucker for Christmas fabrics so the version in Holiday Bouquet is my favorite. Thanks. I love the Bella version! 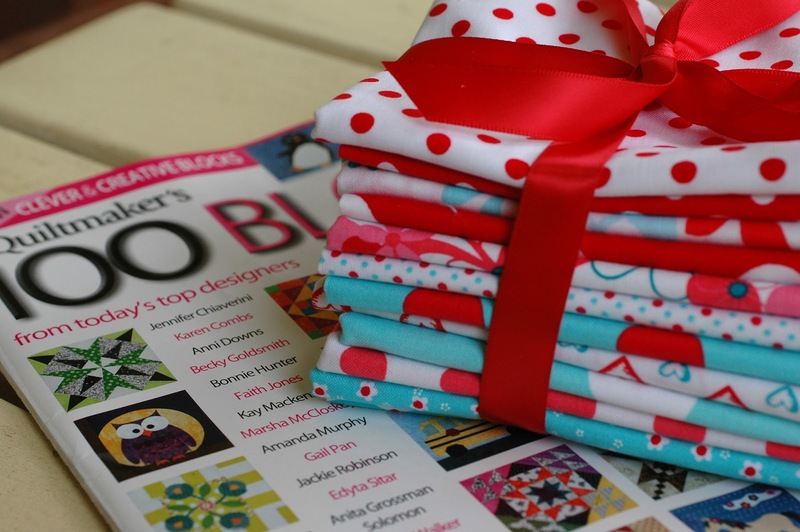 Thanks for the great giveaway chance – love that beautiful bundle of fabric! Lovely block–and really lovely fabrics,too. If I had to choose one, it would be the Bonjour, mon ami. HI!!!! Very pretty!!! I love it all color ways but fave is Bonjour Mon Ami!!! Thanks for the fun!!! I think my favorite is Bon Jour Mon Ami. The browns catch my eye. Last year I use lots brown and grey for my "neutrals" and I really liked the results. Thanks for the giveaway! Have a great weekend. I like the first version best, in Bella, probably because the star in the center stands out. Love seeing the block in different fabrics! Thanks for the chance to win! All the versions are great! However, I have to pick Holiday Bouquet, only because I love Christmas. I really like your block done in the Holiday Bouquet fabric. It would make a great holiday wallhanging. Love Holiday Bouquet, but your lovely block would work for any fabric collection! I love Bonjour and Bella. So pretty and so hard to choose! I love your block. Especially the Holiday Bouquet version. I'm looking forward to seeing this one in the magazine. Fabulous block.I like in Bonjour best . I love Holiday Bouquet — so cute. Thanks for the opportunity to win. Decisions, Decisions! Its a true toss up between Holiday Bouquet and Bonjour Mon Ami! Your fabric designs are so my future DIL!! I can easily see my GO TO source when selecting fabrics for her quilts. They are fun and playful and gosh so cheerful! Very pretty indeed. I love them all but Lollypop in Holiday is my favorite. My favorite is in Bella. Congratulations on being included in the magazine. Thank you for the chance to win the magazine and the gorgeous fabrics. I like the Bonjour mon Ami the best. I love this block! I like the Bella version, but I think it would be a lot of fun in small prints, or even solids, so the star in the center would really stand out. Thanks for the chance to win. I like the second one, Holiday Bouquet. I have never seen prettier Christmas fabric and your lollies look like trees! CUTE! The last on the blog tour, but one of the best blocks I've seen! I love Bella! Beautiful block. Thanks for sharing. I like the Inspired version the best. The Holiday is really nice, too. I think I like the Bella fabrics the best, but it's close, they are all really awesome! What a great way to use all of my large scale prints! Just love it! You have done it again by giving us another fantastic block. It is so very hard to pick just one favorite because I love all of them that you have shown us. On top of that, I think this block of yours is going to look great in red and aqua colors. I just love those colors. So pretty and yet so striking. Thank you for being a part of QM 100 Blocks, Volume 7 tour and giving us all a chance to win. I always enjoy my visits to your blog. There is always something fun to do and you are one busy quilter indeed. Holiday Bouquet is my favorite. What a fun block. Can't wait. I think Holiday Bouquet, but in Bella is nice too! My favorite is BonJour, Mon Ami but this was not an easy decision to make. They are all lovely. Lollipop, Lollipop would be beautiful done in Red and Aqua. Thank you for giving us all a chance to win. Every one of them is grogeous but if I HAD to choose, I would pick the Bonjour Mon Ami one. Thanks for sharing. 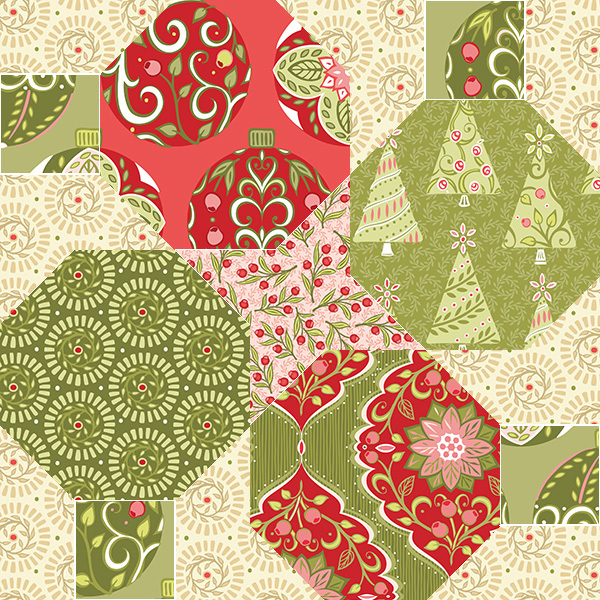 I like the block in the holiday fabric….if I have to choice. 😉 Love your block, congratulations in getting it in the magazine. thanks! I love Bon Jour Mon Ami!!! Love your block!! Holiday Bouquet. This block just says Christmas to me. I wonder what it would look like in a funky Halloween bundle? I love all of your fabric lines but Holiday Bouquet is my favorite. So cute. I really like Holiday Bouquet and see a Christmas quilt in my future. Thanks for a chance to win. I like the Christmas fabric version. Great block! The Christmas fabric Holiday Bouquet I am partial to Holiday themes..
this is an adorable block..
Bonjour, Mon Ami is too much fun! I enjoyed the block tremendously. All your lollipops are wonderful. I especially love the "Lollipops in Holiday Bouquet"
I love the Holiday Bouquet version. Congrats! I love them all, but Bella Lollipop, Lollipop is my favorite. Thank you for the great giveaway. Bonjour, Mon Ami! Anything French will do. Love the collection and that version of Lollipop, Lollipop! I love the Lollipop, Lollipop in Bella version. Really nice prints. Great block – I especially like the Holiday Bouquet one. Great Blocks! My fave is the Bonjour, Mon Ami. Thanks for the chance to win! I love your block. My favorite is Lollipop, Lollipop in Holiday Bouquet. I like your block in Bella the best! I love Lollipop, Lollipop in Bonjour, Mon Ami but all are pretty. Congrats on your block in 100 Blocks. I love it in the Holiday Bouquet.I think it would also be beautiful in the red, white and turquoise. Such a versatile pattern. Holiday Bouquet is my favorite. I like the Holiday Bouquet block the best. I think the lollipops look like Christmas ornaments! I love it in Bella! the colors are so great. Thanks. I like the block in Bella. I am in love with the block It will be on my to do list. I like the block in Bella! Thanks. Holiday bouquet reminds me of Christmas balls. Love the Holiday Bouquet one! Would love to make this with scraps! The center pinwheel is a great surprise! I like the first version with the Bella fabrics the best. I really like how the farics blend together. Your block is so versatile, however, that it looks good in all the different colors. Thanks for having this giveaway. I love Holiday Bouquet best! I think Holiday Boquet shows very well in this block. Congratulations on your wonderful block and new fabrics. I can see this in kids prints too. We are expecting our first grandchild, so I have baby quilts on the brain, lol. I like the christmas version, I love christmas and christmas quilts. I love the Bella fabrics, but I can see the pattern better with the Mon Ami. Thanks for another great chance to win! I love them all!! If I have to choose one it would be the one in Bella. Thanks for the chance to win. Think I prefer Bonjour, Mon Ami but it was a hard choice to make. Grats on being in the magazine. Most definitely my favorite block is Holiday Bouque. Thanks so much for sharing. They are all great but I like how the star pops out in Lollipop, Lollipop. I like it in Bonjour Mon Ami. It looks like a fun block. I would love to see it in black and red. I love the Christmas version–so fun! I can't wait to get the magazine! I love the Holida Bouquet very much, but hard to choose. All look great! I love the block, especially in Bella. Red and aqua bundle–to die for! Thanks for the chance. I like all 3 versions, but Holiday bouquet is my favorite. Thanks for sharing so generously of your fabric. I like the Holiday Bouquet version best of the three. Too hard to choose! But I think Bella is especially pretty. Bon Jour Ami! the contrast is just right. Cute block for the Volume 7. I see little kids Christmas gifts in this issue! Thanks for a chance to WIN a Copy. I really like Bon Jour, Mon Ami's version, and the Christmas one. The colors are fun, and show off the block well. Lovely prints! I like your block using Christmas fabrics…it is just beautiful. Can't wait until I have Volume 7 to try and make it. Thanks for sharing. I like the Bella fabrics. Very nice! Thanks for the giveaway! I love the Holiday Bouquet! Very cute block! Hello! Love your blocks,especially the Holiday Bouquet! 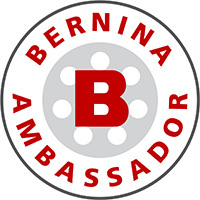 Thanks for sharing on your Blog+this great giveaway! I love your block in Bonjour! Mon Ami. Beautiful block with beautiful colors & prints! Congrats! I love your block, I liked Holiday Bouquet best. I like the Holiday Bouquet. It looks like Christmas balls for the tree. I think all three blocks are beautiful but my favorite would have to be Bonjour, Mon Ami. Thank you! Bon jour mon ami is my favorite version. Holiday version for me, great contrasts. I like your Bella version of Lollipop, Lollipop. I like it in the Holiday Bouquet! I like the Holiday style best. i like Holiday Bouquet because I'm a "sucker" for anything Christmas. I like the Bella; I like the contrast in the block. I love the Holiday Bouquet. The greens and reds are beautiful together. I like them all but bonjour-mon-ami is my favorite. Congrats on having a block in this issue and thanks for the super awesome sparkly giveaway! I watch to many commercials! I like them all, but because I have a weak spot for Christmas fabric, I'm going with Holiday Bouquet. Love your block. I think it would be Bonjour Mon Ami but the Holiday Bouquet is very nice too. Love the little star in the center! Thanks for the chance to win. Definitely the Holiday Bouquet, but I've been thinking ahead about Xmas presents, some of which will be pillow covers, and I think this would make a great holiday pillow cover! Love the holiday colorway best but Bella is a close second. I've been going back and forth trying to decide which Lollipop, Lollipop is my favorite. I'm going to cast my vote for Bonjour, Mon Ami because it is elegant and the color combinations are peaceful and soothing. Thank you for such a beautiful block. Holiday Lollipop would be my favorite and I love your Blossoms pattern I found on your blog. I like the Bonjour Mon Ami because the lollipops show up better. Lollipop in Bonjour, Mon Ami is my fave the blocks seems to jump out a little better on this one. i like the Bella fabric the best. Nice block! I like them all, but Bella is my favorite. My favorite is The Holiday Bouquet because I love anything Christmas. Also love the fat quarters you are throwing in. The colors look fabulous! Thank you for the opportunity to win. Holiday Bouquet is my favorite. Can't wait to try this block. My favorite version is "Holiday Bouquet". 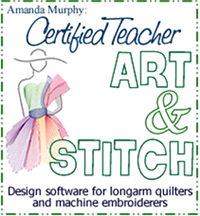 Thanks for the opportunity to win a copy of "Quiltmaker's 100 Blocks, Vol. 7" or Michael Miller's fat quarter bundle. I like the Holiday fabrics version. Bells, I think. What a fun block. I'm sorry the blog hop is over. I've enjoyed it! Thanks for a chance to win. I love how this block looks made up in "Holiday Bouquet." I love your block, and I really like the Holiday Bouquet version! Thank you for the opportunity to win. 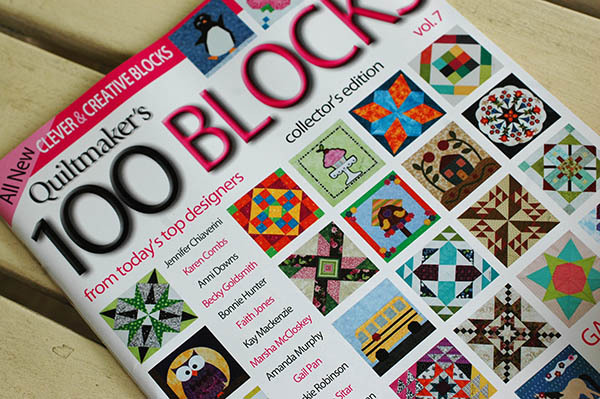 Congratulations on your block being selected for Volume 7 of Quiltmaker's 100 Blocks. It is very pretty and versatile too. Thanks for the chance to win some of your lovely fabric too. I like all the selections so was a difficult choice. Love your block and although I love the colors of the Bella fabric line, your block shows much better in Bonjour, Mon Ami with the contrast that fabric affords. Thanks for a chance to win. Bella is gorgeous fabric, but with your lollipop block we could show of our favorite fabrics. I see polka dots in your Michael Miller fabrics. My soon to be daughter in law loves polka dots. My favorite is in Bonjour Mon Ami. Thanks for the chance to win! one? If that's the case I guess I would have to say Holiday Bouquet. I love the way the contrasting fabrics really show off the design of the block. They are all truly beautiful…great job. They are all pretty but my favorite one is the Holiday block. Great block! The Bella block is beautiful. Lollipop, Lollipop in Bella is so bright and happy! I just love it! I would love to see it pieced in those red and aqua fabrics, too! Those are my current favorite and I am drooling over those!! Congratulations on having your block chosen in Volume 7! I have the other six issues and refer to those all the time for inspiration! I think I like the Bella print best. But all of the are nice. Lollipop, Lollipop in Bonjour, Mon Ami is my favorite. Thanks! I really like the Lollipop, Lollipop in Bella version the best. Mon Ami is my favorite! Thanks for the chance! Holidy Bouquet was my favorite, although they were all beautiful. Thanks for the chance to win. I like the Holiday Bouquet the best, but that would look dynamite in some 30's fabrics, too! I love your block and all 3 of the fabric lines you used!! Such a hard decision, but I think I like Bella the best! I love your block. It's very different. I think it looks best in Holiday Bouquet. Cute block-the Bella version is my favorite! I like your block. The Holiday Bouquet is my favorite version. Of course, I have to say the combination of red and aqua fabrics is the colors that I always seem drawn to use. Made a quilt in those colors for Quiltmaker's 2011 Scrap Squad and have always thought it was special. Your fabric bundle looks great! I love the Holiday Bouquet the most. I guess I'm partial to Christmas fabrics. Thanks for the lovely block. I really like you fabric line, the red and aqua are my favorites because red is my favorite color. Holiday Bouquet is my favorite block. My favorite block is Lollipop, Lollipop in Bella. Thanks for the chance to win! Bonjour, mon ami is my favorite. My favorite is Bonjour, Mon Ami. Thanks for the chance. Great block! I think my favorite is Holiday Bouquet. I have lots of Christmas fabric and could use some of it with your block. Many thanks! I just love anything Christmas….soooo…number 2 is my choice. I really like the holiday pattern block. It makes them look like ornaments! Thanks for the chance to win. Love the red and green block. Thanks for the chance to win. 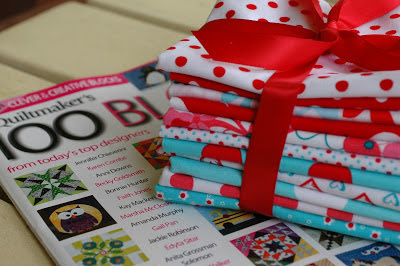 Even though I love Christmas fabrics, I like the lollipops in Bella the best. They look good enough to eat! Amanda ~ you're making it tough on us when you give us three beautiful blocks and ask us to choose between them. I like them all, but really love Holiday Bouquet the most. I think Holiday Bouquet is my favorite. I love red/aqua fabric, so I hope I win. Thank you for sharing! I love it in the Bella fabrics: so pretty! Great block! My favorite version is the Holiday Bouquet. Think I like the original Bella best, like how the center pops! Thanks for the chance! what a fun block! Personally, I like Bonjour, Mon Ami best! Love your block and the name!! I like the one in Christmas fabric the best because they kind of remind of Christmas balls you would hang on your tree. Thank you for sharing. My favorite was Lollipop, Lollipop in Bella. I just love all the swirls.. gives this block movement Thanks for the chance to partake in your give-a-way. Congrats for being chosen as one of the 100 Blocks in vol. 7. I love Holiday Bouquet with the Christmas fabrics. It would also look great in the Michael Miller fabric you're giving away. Love the Holiday Bouquet very much. Great Block! I like the Bon Jour block. Love the fabric. I like the Bella version with the prominent turquoise Friendship Star the best. I like the Holiday Block best. The shapes make me think of Christmas ornaments. I love the Bella! And I'd love to win your beautiful bundle and book! Can't choose. They all are great! Oh boy, I really love this block! My favourite version is done in "Bella". Thanks for a chance at the give-away! I like Bonjour Mon Ami best. congratulations on being chosen for Volume 7. I like it best with Bella! I love "Lollipop, Lollipop in Holiday Bouquet"
Ooooh…Lollipop in Bella! Great Block! I like the Christmas block. I can see lots of possibilities with it! Bon Jour, Mon Ami is my favorite, love the star in the center and it really pops in that color way! Lollipop, Lollipop in Holiday Bouquet is my favorite, but it would look fabulous worked up with any collection, like your michael miller red and aqua bundle. I like the Holiday Bouquet version. Like the stronger contrast. They are all lovely, but I like Lollipop, Lollipop in Holiday Bouquet the best! Thanks for the chance to win. Holiday Bouquet or Bon Jour Mon Ami. Thank you for offering! I love all three though Holiday Bouquet wins the #1 place. Great block; I love the extra star in the middle as another design feature. I like the holiday one – I love holidays – doesn't matter which one. Gorgeous block! I agree with some other comments, how can we choose when you show us three beautiful fabrics? hehe. I'm going to pick Holiday Bouquet with Bella a close second. I really like Holiday Bouquet – very festive. Congratulations on your really cute block appearing in the magazine! I like Bonjour, Mon Ami the best! And thank you for the opportunity to win! Bonjour, mon ami…it shows the central/hidden star the best. I like them all, but I will have to choose Lollipop, Lollipop as my favorite. Thanks for a great block! I love Lollipop, Lollipop in Bonjour, Mon Ami — I think it's a modern color combination and I can see using it in Kim McLean's Lollipop Trees…. The block sample using bonjour is the more graphic, since I like the contrast of the green star with the other fabrics best. Love your block done in Bonjour, Mon Ami. I like Holiday Bouquet, but the are all very nice. Thanks for the giveaway. Loved your block! It is so pretty in all the fabrics but my favorite is the Bella collection. Thank you for all of the scrappy inspiration. Congrats on being published and thanks you for the chance to win! I think I'll go with the Bonjour, Mon Ami version as it gives me more space to rest my eyes. I'm drooling over the red and aqua fabric. So bright and cheery. I like the Holiday Bouquet the best. Holiday bouquet was my favorite. Nice.. I pick Holiday Bouquet; I'm kind of partial to Christmas fabrics! They're all so cute, but I like Holiday Bouquet best. 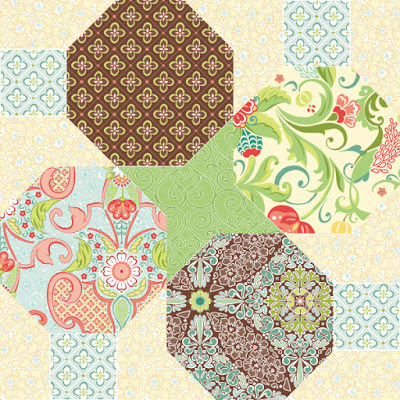 This block is great – my favorite version is the one done in Holiday Bouquet. Lollipop, Lollipop in Holiday Bouquet has got to be my favorite. That's probably because I know I need to get started on something for Christmas! Thanks for the chance to win! Cute block! My favorite is Bonjour Amie! Love them all, but Bonjour, Mon Ami really makes that center star POP!!! Very fun- I can't wait to get my copy and play with this block! Definitely the christmas themed lollypop but they are all very pretty. Very cute little block! Nice job! I like the Bonjour block the best! Hello. This is Victoria, from Spain. I love the Bonjour mon ami option. Thanks for your blog and this giveaway. Love! I like Bella best, probably because the fabric colors are more my taste! What an interesting block. Love the Christmas version. I just knew that you'd have a new block in this issue. It goes without saying that the Bella version is my favorite because that is my absolute fabric line of all. I wish I could be going to market. Thanks for the chance to win. My favorite is Bella, I think this block would look fun in solids as well. Very versatile. favorite version is Bonjour, Mon Ami. Thanks for the chance to win! Love your pattern and fabrics you used. Anything Christmas grabs me so I like the second block the best. Hello, I really like them all but my fave is the bella, it is so colorful.Thank you. I like the colors in Bella for the Lollipops. The background is a bit stronger than the others but I like the colors. I like the Bella version. Thanks for sharing. I love the holiday bouquet the most – it looks very festive! I adore your block – espcially in Bella! thank you! They all look delish. maybe the holiday but only by a nudge. So pretty. THanks. What a cute and clever block! My favorite is Holiday Bouquet. Thanks for a chance at a wonderful prize. Red is my favorite color and aqua is a wonderful complement. Great block, I like Holiday Bouquet the best. I was envisioning quilting on it, that would make the lollypops stand out. I would definitely pick Bella, especially since I have most of the prints in that group. I love the one in Bella, because the blue in the middle is perfect. Wish I could be at Market, but I guess I'll have to settle for entering the drawing, ha ha. I really like the Holiday Bouquet but it's hard to choose. Bonjour, Mon Ami is the most gorgeous of all the three gorgeous blocks! My favorite is the block done in Holiday Bouquet. So fun! Thanks for having a giveaway! All the versions look great with your wonderful block. I think your pattern can make any fabric look great! Choose as I must, I like the Holiday Bouquet. Kudos on your fun block!! Yummy block! Boy it is hard to pick, but I think I like Holiday Bouquet the best. I love the whimsical feel of the Lollipop Lollipop in Bella. It is fun and fresh! i love the bella version. the colors are springy-summery! Mi preferido es Bonjour mon ami. I like it in Holiday Bouquet. Thanks for the chance to win. 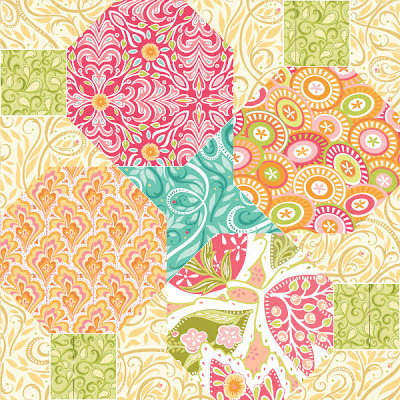 The block looks quite different in the three fabric collections; my favorite would be Bella. are all great, I like Holiday fabrics. Thanks for the chance to win. Love lollipop in Bella! Love those Christmas fabrics, too. Thanks for giveaway opportunity. I like Holiday bouquet but all of them are wonderful. Congratulations for having a block in this issue, Amanda! Great name for this block. My favorite is the one made with Bella. I love the block in Bella…it really makes me think of candy! I love them all but my favorite is the one made with Bella. Great job. I love Lollipop, Lollipop I Holiday Bouquet, but I like all of the others, and immediately though of something in my stash that would work really well in this block. Cute block. Thanks for the chance to win. They are all lovely but I think I'd choose Bella as my favorite. I like the holiday version of your block! Oh, dear, now I've got that song in my head…. Your Bella block speaks to me! I like the block in all your fabric choices — but Bella would be my first choice. I have to vote for Bonjour Mon Amie because I've just come back from a trip to Montreal and enjoyed practising my french!